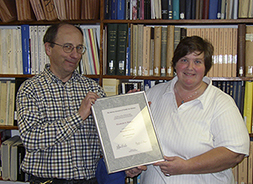 Elizabeth started working at the AAVSO in 1979 after graduating from Smith College in Northhampton, MA. She began as technical assistant to Director Janet Mattei. Over the next 25 years the variety and number of her responsibilities grew. In addtion to her current position as senior technical assistant and associate editor of the JAAVSO, since Janet's illness, Elizabeth has been serving as the AAVSO's Interim Director. In addition to the plaque, we invited the full staff, as well as Elizabeth's mother, over to headquarters for a surprise celebratory lunch. The staff gave Elizabeth two gifts in appreciation— both for the quality work that she does and for the warm and caring friend that she is to us. One gift was an onyx pedant with silver trim and the other was a gift certificate for two to have brunch aboard The Odyssey, a cruise ship that sails around Boston Harbor. We hope she will stick around for 25 more years!